More and more people are opening up to the wonderful, kind idea that Thanksgiving can be a celebration of family and helping others – no turkey needed! We can’t think of a better way to commemorate the spirit of that day in 1621, when Native Americans feasted with the pilgrims at Plymouth, after helping the pilgrims survive their first year in the New World. In the Adopt-a-Pet.com world, helping “others” definitely includes animals. So we came up with a few new Thanksgiving Traditions we hope you’ll make a part of your annual thankful day. – Volunteer to help homeless farm animals, like turkeys! You can register as a volunteer on Adopt-a-Pet.com and check “Farm Animals” under the type of animals you’d like to help. – Search for any type of homeless pet near you on Adopt-a-Pet.com and then click the “share” button to share with your Facebook friends or Twitter followers. You might help a homeless pet near you spend their first year in a new home! Lots of furry pilgrims out there could use your help in being seen, so they can be adopted. – A traditional Thanksgiving feast already offers a mouth watering array of vegetarian and vegan (or easy to vegan-ize) dishes. Try skipping the turkey this year – we bet you won’t even miss it! Check out the delicious & humane Thanksgiving recipes made by our friends over at Care2 in case you need some inspiration. – In the spirit of NSAL’s Paws to Give Thanks campaign, remember and give thanks the unconditional love, loyalty and joy your pets bring to your lives everyday by donating to an animal welfare cause. – And finally, for the safety of your pets in your home, we highly recommend making a tradition of following NSAL’s Thanksgiving safety tips we link to in our our previous blog. 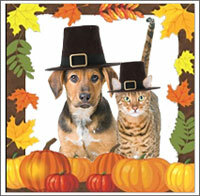 Have a humane & happy Thanksgiving!